Greetings one and all! I hope you are doing well and loving life. Once again, I invite you to take a deep breath, pour a cup of coffee or hot tea, and relax. I have been running nonstop since before Thanksgiving. I imagine you’ve been busy as well. So, it’s time to take a break and reflect a bit on the holiday hullabaloo. I just cruised through one of the busiest malls in Denver. Although it was a Monday morning, the mall was filled with people dashing about doing their holiday shopping. Shopping is not my thing, so malls are not my favorite place to be! However, I went to the mall to meet a friend at our favorite sushi restaurant for our annual holiday lunch and gift exchange. Consequently, I arrived with a different agenda than most of the people scurrying in and out of the stores. I was not on a mission to find the perfect present in record time. Instead, I had the luxury of window shopping and people watching. An interesting experience indeed. For a season that is supposed to be filled with joy, I noticed little evidence of joy on the faces of those who rushed by. In addition to being weighed down by countless shopping bags, shoppers seemed burdened by a tremendous amount of stress. Young mothers tried to appease tired children who expressed their displeasure in ear piercing ways. Couples debated the merits of gift options, often without reaching consensus. Individuals rarely made eye contact; instead, they focused on weaving in and out of the crowd in the most expeditious manner possible. As a result, few people seemed appreciative (or even aware) of the festive holiday decorations and music. There was little joy in Whoville! While mulling over the scene before me, my eyes were drawn to a little girl who radiated joy and calm. The little girl was with her grandmother. They both seemed to savor every moment together—present to the moment and the sacred season. We were all standing in line, patiently waiting to place our orders for coffee creations or hot chocolate. The little girl must have sensed my gaze, because she turned and looked directly at me. She then graced me with a radiant, infectious smile. Grinning from ear to ear, we engaged in a heartwarming conversation. The little girl was incredibly poised and articulate. But she was so much more. She was captivating. As we were saying goodbye, she looked directly at me as if looking into my soul and said, “You have the most gorgeous blue eyes. Beautiful!” Somewhat surprised by her observation, I thanked her and wished her a very special holiday before parting ways. Sipping my coffee and reflecting on this brief encounter, I realized that I had just received a care-FULL gift from a stranger. A little girl who didn’t know me took the time to truly see me. She not only saw me, she also expressed appreciation for my presence in this world. She cared. And because she cared, I walked a little taller. I felt a bit bolder. And I was (am) inspired to offer care-FULL gifts to family, friends, and strangers. Gifts that require no financial investment but are priceless nonetheless. Instead of running errands, I choose to spend my time seeing and being with those people who cross my path. By so doing, I hope to pass along the care-FULL gift I received from the little girl—a little old soul that graciously reminded me of the essence of the holidays. 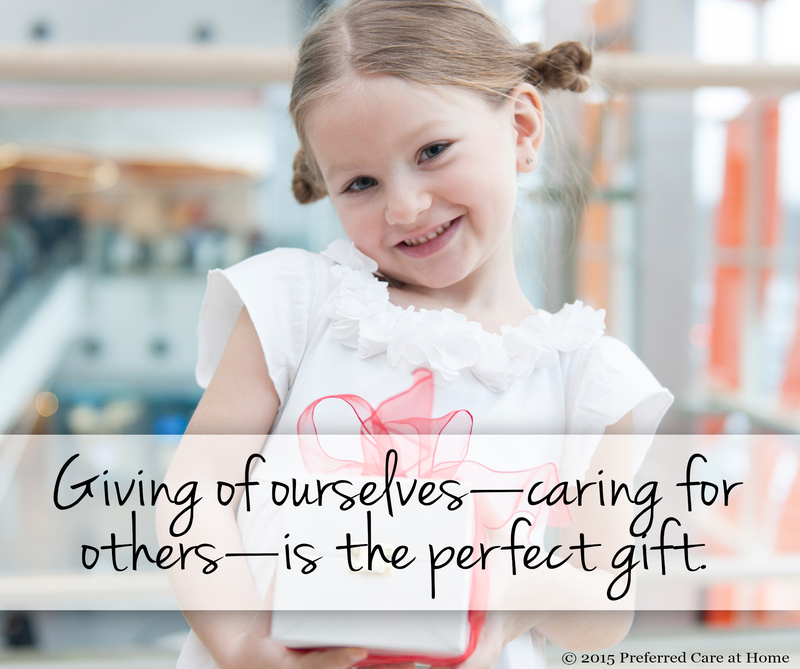 Giving of ourselves—caring for others—is the perfect gift.